Vivago MOVETM solution supports you to feel safe and to stay healthier in your everyday life and in situations where help and support is needed. It helps during the healing processes and in situations when you need to gather strength to feel well again. Living longer and safer at home is possible when the needed and reliable support is available – regardless of the time and place. 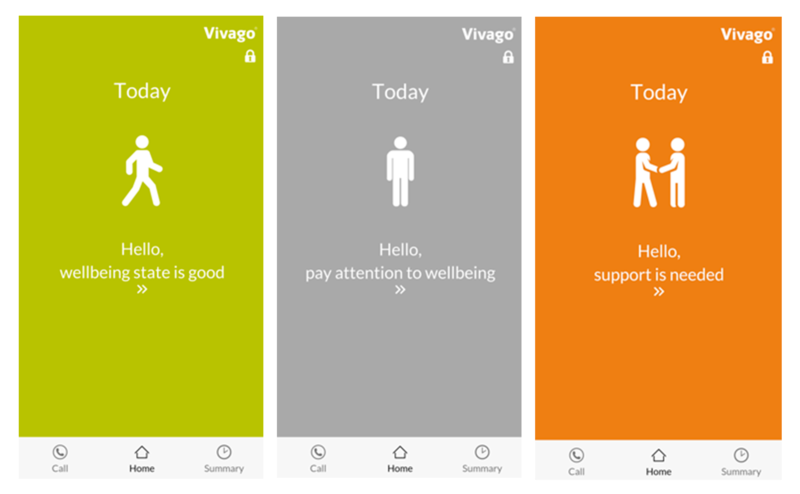 Vivago MOVETM combines unique safety solution with wellbeing and health status monitoring. Real-time health status and wellbeing information supports timely and proactive care which is based on individual needs. Vivago MOVETM creates protection at home and outdoors. Solution can send an automatic alarm if you are unable to call for help and your condition is threatened. You can also call for help just by pressing a button – whenever needed. The solution measures user's activity, sleep and circadian rhythm. Automatic notifications and alarms inform when user's wellbeing is changing. The solution consists of Vivago MOVE watch and Vivago MOBILE application. All you need is the watch, a smart phone and the mobile application. It’s that easy! Also care providers and relatives can receive user’s wellbeing and health status information. Vivago MOVE informs user’s location which provides additional safety outdoors. Stylish Vivago MOVE watch comes in three colours – silver, green and black. Vivago solutions have been awarded with several international and national rewards.